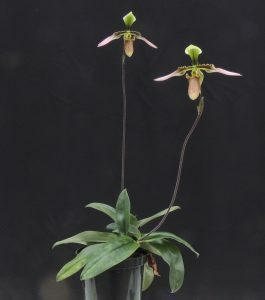 One of our favourite Paphiopedilum species is the beautifully coloured and long stemmed Paphiopedilum appletonianum. 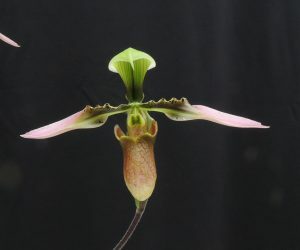 In common with most Paphiopedilum species P. appletonianum is a terrestrial, and this species grows in leaf litter and amongst boulders in warm forests from 300-1200m in South East Asia and Southern China. Plants have wonderful dark patterned leaves (almost as good as the flowers) and it enjoys deep shade in our Warm Asia section where we keep it watered throughout the year. 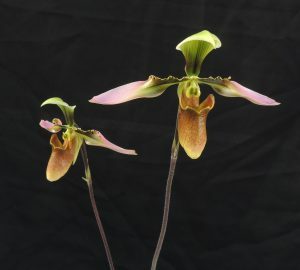 We have witnessed this threat and have seen hundreds of illegal wild Paphiopedilum plants for sale in Laos and India. These illegal plants do find their way into Europe where they masquerade as legal plants and so it is really important that people only but seed raised plants, and support conservation initiatives for the plants they love. 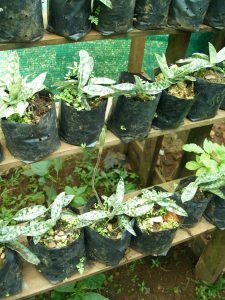 The photo shows wild collected Paphiopedilum plants in Southern Laos ready to be sent illegally to Thailand and sold as nursery raised plants. We have had our seed raised plants since 1998 and every year they reward us with these beautiful flowers. Lets hope that generations to come will still be sharing their planet with this wonderful species in its natural habitat.